This has become one of my favorite Mexican appetizers that is quite simple to make and it doesn’t require a lot of ingredients! It can be a meal with a tortilla or an appetizer with chips. Spray pepper with non-stick cooking spray and bake in the oven at 375 degrees for 20 minutes. Remove and let cool. After pepper has cooled, remove skin, seeds and stem and dice into small pieces. In a medium size skillet heat vegetable oil over medium high heat. Add onions and sauté until onions are translucent. Add chorizo and sauté breaking up larger pieces so sausage is evenly cooked. Add diced pepper and sauté for one more minute. Remove from heat and set aside. 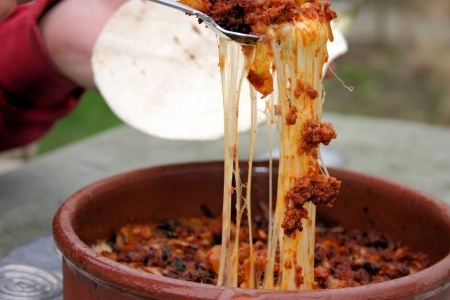 In a medium sized baking dish add shredded mozzarella cheese, top with the onion chorizo mixture and place into a preheated oven at 375 degrees for 15 minutes or until cheese is bubbling. Remove and serve with flour tortillas or tortilla chips. Try Prickly Pear Margarita, Guava Margarita, Classic Margarita, Tecate or a Corona with a wedge of lime.